April 18th 2019, Dueren, Germany - After Trüberbrook received the most prestigious award of the German gaming industry last week - "Best German Game" at the German Video Game Awards - the atmospheric sci-fi mystery adventure game is coming to consoles today. Enjoy Trüberbrook's handcrafted scenery on your Nintendo Switch, PlayStation®4 or Xbox One and immerge into an adventurous vacation to a 1960's parallel universe! Trüberbrook is already available for 29,99 € / 29,99 USD / 24,99 GBP on the Nintendo eShop, Microsoft Store and PlayStation®Store (EU/US). PC, Mac and Linux players can purchase the game on Steam or GOG. The Console Launch Trailer will give you the last pieces of information you need for your relaxing journey to Trüberbrook. In addition, you will get a sense of the abnormal events that will take place in the small German health resort. Check it out now! If you prefer one of the physical retail boxes for PS4 or Nintendo Switch: They are also available today at your favorite games dealer, and include a 24-page long travel guide! With its superbly unique visual style, German charm, and a thrilling story of the likes of Twin Peaks and X-Files, Trüberbrook comes as a modern adventure game appealing to fans of the genre and everyone who like to see a fresh artistic experience. Month ago, the game was crowdfunded and reached its goal on Kickstarter within only 30 hours, amassing over $200,000 in total. March 11th 2019, Dueren, Germany - At the glamorous gala of the German Video Game Awards 2019 (DCP), Trüberbrook shined in not just one, but two categories. The adventure game was first awarded with ‘Best Staging’, and in the end of the show also was crowned with ‘Best German Game’. This category is every year's most anticipated award of the German gaming industry. Trüberbrook may be out today on PC, but Switch owners will have to wait just a bit more. As we learned last week, the game is scheduled to launch for Switch on April 17th, 2019. We can´t wait for release day next Tuesday and are evenly, if not more exited for the award ceremony on the 9th of April. 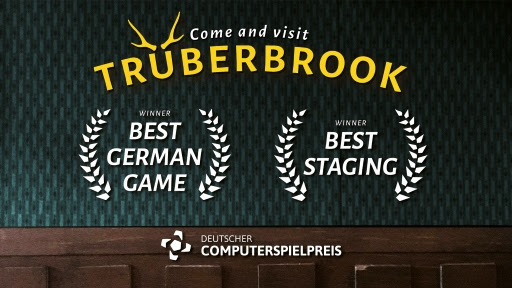 Trüberbrook will be released on Steam on March 12th, console players will start their journey on PlayStation®4, Nintendo Switch and Xbox One on April 17th. With its superbly unique visual style, German charm, and a thrilling story of the likes of Twin Peaks and X-Files, Trüberbrook comes as a modern adventure game appealing to fans of the genre and everyone who like to see a fresh artistic experience. The game was crowdfunded and reached its goal on Kickstarter within only 30 hours, amassing over $200,000 in total. We did it! Finally, the game is finished! Trüberbrook just got one step closer to launching, even if there's more work to do on the console versions. Trüberbrook's developer has confirmed that the game has wrapped on PC, but some tweaks still need to be implemented for the console versions. Hopefully we get a solid release date somewhere in the near future. As a special treat we proudly present you with two brand-new and beautiful screenshots - straight out of the latest build.